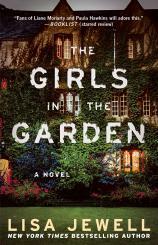 In the dedication to her new novel, THE GIRLS IN THE GARDEN (originally published as THE GIRLS in the UK and since retitled to avoid confusion with Emma Cline’s book by the same name), Lisa Jewell thanks her neighbors who share a garden much like the Virginia Park that serves as the centerpiece of the novel. Well, hopefully not too much like Virginia Park, which is not only the site of neighborly gatherings but also, in the book’s very opening pages, the location of what appears to be a brutal attack on a young girl. Eleven-year-old Pip and her 12-year-old sister, Grace, have recently moved with their mother to a new apartment that abuts Virginia Park, a private communal garden shared by all the neighbors with homes on Virginia Crescent, ranging from large manor homes to modest apartment blocks. The garden is leafy and cool, private and shady, the perfect spot for children’s imaginative wanderings and teenagers’ assignations. "[T]he real heart of the matter...is the book’s exploration of the fear and mistrust that can arise among friends, neighbors and loved ones, even those who share everything, including a back garden." Unbeknownst to their new neighbors, however, Pip and Grace are harboring a secret: their father isn’t just gone, or even dead as Grace has suggested. Instead, he is in a psychiatric hospital, committed after a schizophrenic break that caused him to burn down their old house, at a time when the girls easily could have been trapped inside. Grace resents her father’s absence, but Pip longs to have him back in their lives and writes him letters about their new surroundings and their beguiling new neighbors, the Howeses. Adele and Leo and their three teenage daughters live in Leo’s childhood mansion on one end of the park. The girls are homeschooled and have spent as much of their lives roaming wild through the park as they have in more formal settings; they have developed a fierce loyalty to one another and to their longtime neighbors. So when Pip and Grace arrive on the scene, the dynamic among the park’s young people changes, prompting suspicions and questions and even investigations into mysteries that date back decades. “Things happen in that park differently to how they happen in the real world. Different rules apply,” remarks one character about the private park where the majority of the novel’s action occurs. Although THE GIRLS IN THE GARDEN is ostensibly a mystery, an unraveling of the violence that has occurred just before the narrative’s opening pages, real mystery fans may grow frustrated with the plotting in the first half, during which each scene can feel like an opportunity to introduce yet another character with an apparent motive. The outcome of the mystery plot is surprising nevertheless; the real heart of the matter, though, is the book’s exploration of the fear and mistrust that can arise among friends, neighbors and loved ones, even those who share everything, including a back garden.